I am not doing one-on-one sessions at the moment - I can recommend people who have been trained by me for either channeling or chakra healing session via skype - 77 euros per hour session - please email me for details. 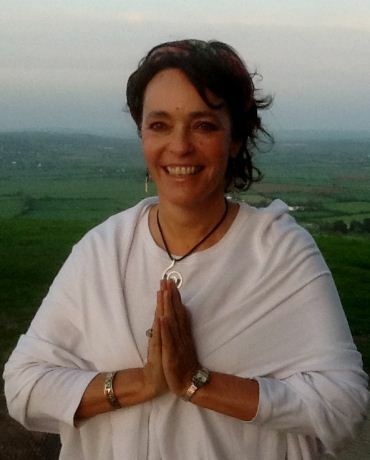 I practised as a healer & alternative therapist for 20 years before I started my teaching path. After travelling and teaching intensively between 2007 and 2012, I have now settled on the island of Ibiza, Spain, where I am offering private retreats. I have gone back to my roots, once again practising craniosacral therapy, massage, reflexology & chakra healing. 1 hour therapy sessions, which often include a combination of these skills, cost 77 euros. Solara trained in the Martin Broffman school of chakra healing, and now combines this skill with the multi-dimensional skills her Pleiadian and Arcturian guides have taught her. The 7 primary inner chakras need to be in balance in order for us to be functioning healthily in our everyday lives - money/home/job issues are all related to the root chakra - sexual issues relate to the sacral chakra, and so on. 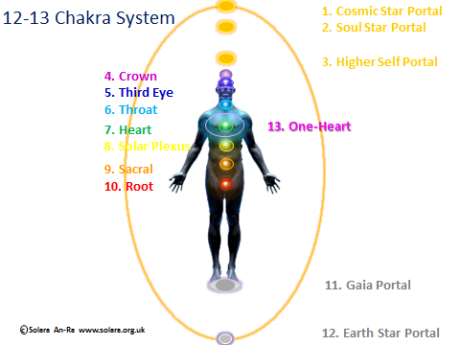 The 5 chakras external to the body control our connection with our Higher Self, guides, Soul Star family and so on. We are in the process of becoming multidimensional and receiving new codes ~ the activation of our 12-13 chakra system is a crucial part of this process and Solara's guides can assist in the process. This is a magical form of healing - an offshoot of Osteopathy now recognised by Western Medicine as one of the most powerful and healing modalities for neck and back problems, fertility, headaches, depression, anxiety, MS & many more ailments. This very gentle form of body work uses no manipulation. The therapist listens with the hands for any restrictions to the free movement of the fluids, the tissues, the cranial bones and the spine & restores health by releasing restrictions. The entire body is treated this same way, so that old injuries can resurface and then be healed. Craniosacral helps to balance the body on more than just a physical level – the mental, emotional and spiritual aspects are often part of the healing process. The body’s own self-healing forces are stimulated, and the client’s vitality is heightened. This technique aims to restore the vitality of your body via the nerve endings in the feet. It is not simply ‘foot massage’ – stimulating these points on the feet sends impulses up through your nervous system, affecting the energy and health of your whole being. Clients are amazed not only by how relaxing and restorative reflexology is, but also by how far-reaching its affects are. It is particularly good during pregnancy, for ‘bringing the baby on’, for insomnia, anxiety, IBS and high blood pressure. Combining a back & neck massage with reflexology is one of the most relaxing, restorative treatments you can have! Massage is one of the skills that should be taught to children at school - and which should be practised by family members on each other as part of daily life It improves circulation, relieves head, neck & back tension, soothes frayed nerves, and above all, it is a divine treat! Solara no longer does full body massage - she combines back, neck & head massage with whatever else is most effective for your state of mind-body-emotions, either healing, craniosacral or reflexology. Dear Solara, The session I got from you was a life changing experience! I have been looking for help all over the world, in Bali with the famous healers and with Inca Elders from Peru to name some of them. My dear Solara... I have to just write and give you some feedback on the phenomenal experience I had with your energy session! I had no idea some healing work would be included, my gratitude to the universe!